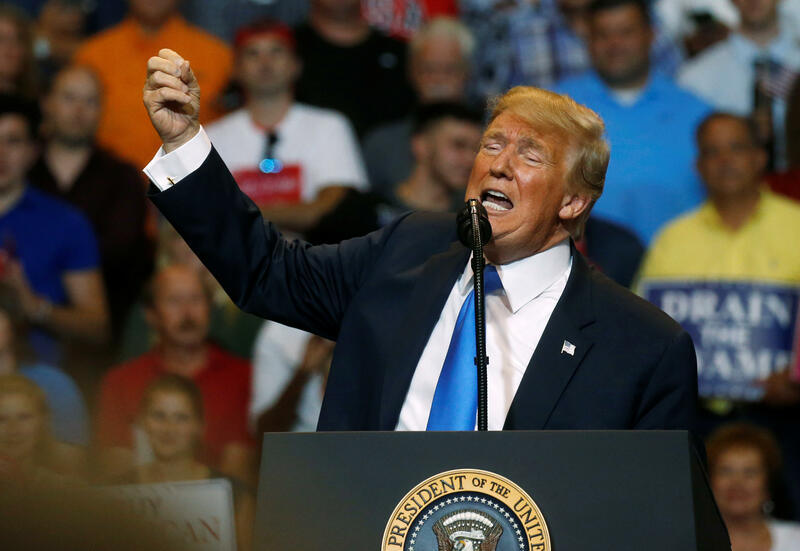 President Trump rallied his supporters in Wilkes-Barre Township, Pennsylvania, Thursday night for the second of three "Make America Great Again" rallies in one week. The rally was ostensibly to champion GOP Rep. Lou Barletta, who is running against Democratic incumbent Sen. Bob Casey — but it encompassed many of the president's go-to topics. Mr. Trump called Barletta "dynamo." Barletta, for his part, praised Mr. Trump in a brief but energetic speech. The president dubbed Casey, "Sleeping Bob." "We need Republicans. We need Lou Barletta. He is tough. They're liking you, Lou. They're liking you," Mr. Trump said Thursday night. But, as often happens in such rallies, the president touched on a number of topics unrelated to the 2018 midterms. He particularly spent time airing grievances over media coverage, after again calling the "fake news" media the "enemy of the people" earlier in the day. Mr. Trump kicked off his rally with a trip down memory lane, reminiscing about the 2016 presidential election, reliving his victories state by state and how the press covered them. Mr. Trump also spent a chunk of his speech expressing his frustrations with media coverage of his summit with Russian President Vladimir Putin in Helsinki, Finland, and meeting with North Korean leader Kim Jong Un in Singapore. Mr. Trump emphasized that meeting with foreign leaders like Putin is a good thing. The president did not mention Russian meddling in the 2016 election or attempts in the 2018 midterms, which top Cabinet officials denounced only hours earlier in the White House press briefing. "I had a great meeting with Putin, we discussed everything," the president said, decrying media coverage of the aftermath. Mr. Trump said the media even tarnished his meeting with Queen Elizabeth in England. "They can make anything bad because they are the fake, fake, disgusting news," the president said, before adding it was time to get back to "boring" topics like Bob Casey. Mr. Trump advertised his Pennsylvania trip earlier Thursday. "Looking forward to being in the Great State of Pennsylvania where we had a tremendous victory in the Election. Will be campaigning hard for an original supporter, Lou Barletta, to replace a weak an ineffective Senator, Bob Casey. Lou is tough and smart, loves PA and our Country!" Mr. Trump tweeted. Barletta needs all the help he can get from Mr. Trump. A Real Clear Politics aggregation of three polls since April shows Casey up 16 points.